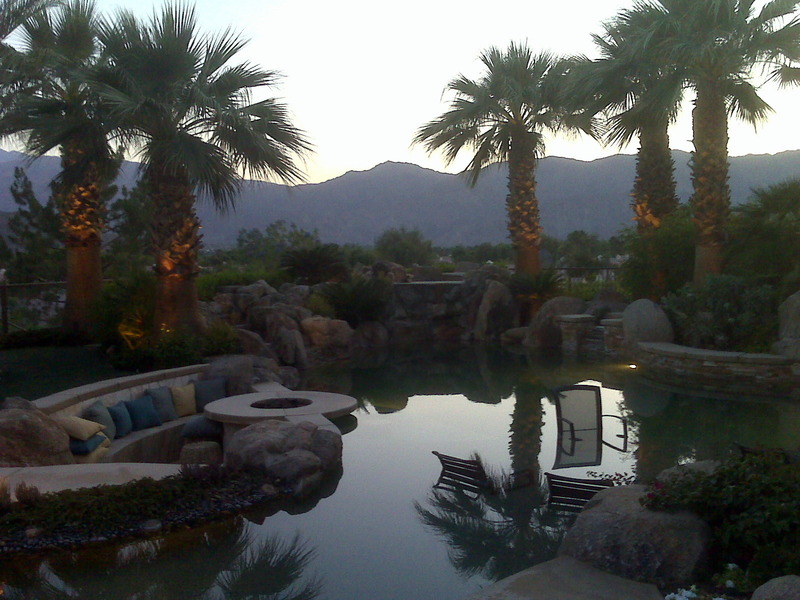 The last weekend in April I was hired to bar tend an executive retreat at a fantastic home located within the PGA West La Quinta Resort. It was a different kind of gig than I am used to doing, because we were only serving 11 people. They requested a server also and I contracted a local girl to help me. The house had a great set up for entertaining, including two marble bars, an incredible pool and Jacuzzi, fire pits and first class barbecue grill. The temperature was over 90 and the executives stayed in the pool for the first couple of hours. I made a vodka punch with Kettle One, cranberry juice, and sliced oranges that went over well. The chef/caterer, Laz Jefferson, served appetizers which included some of the best grilled prawns I have ever tasted. A few of the guests moved inside to the bar and enjoyed Cuba Libres ala Captain Morgan, while one of the execs played background music on the piano. Later, everyone dressed and we set the table for dinner. Laz Jefferson created an incredible meal which included tri-tip, halibut, grilled vegetables, a mixed green salad, and rice. The server I hired and I helped serve the meal while the guests discussed their business. I have found that “invisible service” is called for in situations like these. Sometimes guests want to be entertained by bartenders and servers, and this was not one of those times – business was at hand. I am capable of doing both kinds of service and know the difference. I decanted and served the wine, which was a fine Napa Valley Cabernet. The night ended with an incredible hand-crafted desert by Chef, Laz Jefferson, and after dinner drinks hand crafted by me. Shaken Not Stirred pulled off another successful in the desert. The pool party season has officially begun, and we are geared up for it. Shaken Not Stirred provides bartenders and servers all over Southern California for pool parties, executive retreats, weddings, birthday parties, and corporate functions. We serve Los Angeles, Orange, Ventura, Riverside, San Bernardino, and San Diego counties. Book your event today because dates are filling up for the summer season.